Are you after a sophisticated dress for your big day? Perhaps you need a ravishing look for that pre wedding do? Well, we’ve got you covered with our range of exquisite options featuring beautiful lace detailing, delicate ruffle trimming and elaborate embroidery elements. Browse through our stunning collection of gowns and dresses from our Wedding & Bridal Dress Collection. Take his breath away with a regal mermaid silhouette, luxurious form fitted midi or take a slightly more modern approach with a detailed feminine mini dress. 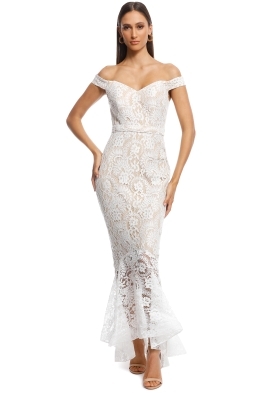 Rent your ultimate wedding look for a fraction of the retail price today! For more wedding style tips read our Ultimate Bride-To-Be Event Planning Style Guide blog post. My fiance and I eloped to NZ and I knew I wanted a dress that was classic, easy to travel with and would look beautiful. I ordered the dress a few months ago and received it 5 days before we left, and it fit like a glove! I was so happy. This dress was everything I wanted it to be and more. I'm a standard 8-10 so I order the 10 and it was perfect fit. Thank you so much to GlamCorner for providing this service, it's not the first time I have used you and it definitely will not be the last! I rented this dress for Melbourne’s Guineas Day and it was such a comfortable dress to wear in the heat. Although heavy material, it sat beautifully and had cut outs in the right places so as not to get too hot! I am a 6-8 in size and wore the size 6. It fit perfectly. Perfect for my hen party! Got so many compliments on this dress. It was flattering and fun!